There are albums that don’t bring anything new at all to the world, but due to unexplained ways, it catches the years of the listeners in a way that they can’t detach themselves from the music that is playing. 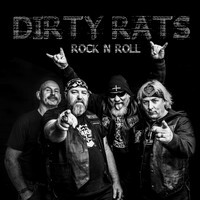 And it’s time to say: lock up your sisters and mamma into the closet, because the Australian bastards from Melbourne named DIRTY RATS are here to unleash a nasty and Rock ‘n’ Roll dirty fury with “Rock N Roll”. Their music is nothing anything new at all: it’s just the old and good Heavy Rock from the 80’s, because the band is from the 80's (although they entered on a long time hiatus). It’s savage, nasty and crude as AC/DC, with a more melodic sense. The vocals are melodic (with a touch of roughness), the guitars unleash excellent and simple riffs (and good solos), and the bass guitar and drums create a solid and heavy rhythmic basis. It’s not virtuous, it’s nothing new, but it has that excellent and energetic insight that can’t be forgotten after you heard their songs only one time. On the production, they had a very good work: even sounding clear and modern (due the modern recording technologies), it has that crude and nasty touch that Australian Rock ‘n’ Roll bands bear with pride. The organic feeling comes from the instrumental tunes, because it seems to be like a “plug and play” recording, without endless editions. And be prepared, for these rats aren’t kidding. The nasty and almost Punk Rock energy of “Not Alone” (very good catchy chorus, good vocals and guitars), the slow and melodic tempos of “Suicide”, the “hit in the bull’s-eye” “Bad Man” (very good rhythmic work from bass guitar and drums), the greasy melodies of “When the Money Runs Out”, and the bluesy Rock ‘n’ Roll inspiration that can be heard on “Everybody Bleeds” are the ones that the listeners won’t forget so soon. The other ones are equally at catchy. Long live the bastards, for DIRTY RATS are here for booze and Rock ‘n’ Roll. Hear “Rock N Roll” and try to stay stopped in the place.